Make the cake batter as per directions on the box. Lightly spray your temp-tations® Texas Muffin Pan with non-stick spray. Fill each muffin cup 2/3 the way up. Bake in preheated oven for 22 - 25 minutes, or until a toothpick inserted into the center of the cupcake comes out clean. Allow to cool for 10 minutes, remove from muffin pan and cool completely on a cooling rack. Take a 1/2 cup of the icing and put in a small bowl. Add a couple of drops of blue food color and mix. You want a nice ocean blue color. Set aside. Ice the top of the cupcake with vanilla icing, using a spatula. Cover 3/4 with crushed graham crackers. Spread the blue icing on the remaining cupcake not covered with the cracker crumbs. 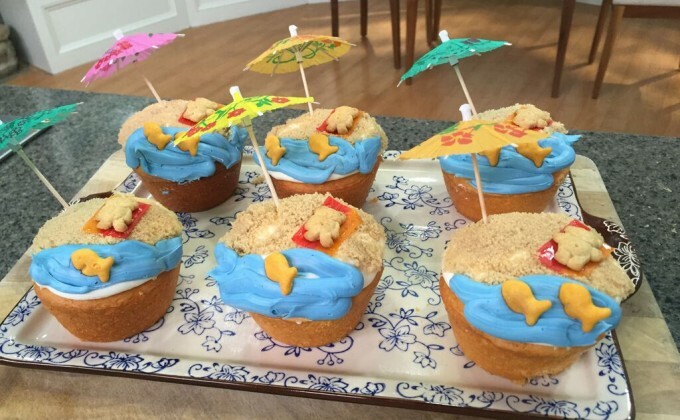 Cut a 1 inch piece of fruit strip and place on the cupcake to look like a towel on the sand. Put a teddy graham cracker on the fruit strip towel. Put 1 - 2 goldfish crackers into the blue icing to look like fish in the sea. Open the paper umbrella and place into the sand on the cupcake.